When I first rode a tricycle in Manila I sat behind the driver the way men do in Nepal when they ride pillion on a motorcycle. I was told later by a Filipino friend of mine that that was the wrong way of sitting on a tricycle. The correct way, I was told, was to sit like the way most women-especially those clad in saari- do in Nepal: by hanging both legs on the same side. But that’s for the third (and last) passenger on a tricycle. The other two are holed up in a small carriage- supported by a tire- on the right side of the motorbike. When that carriage is attached a bike becomes a tricycle (or a motorcycle taxi). And tricycles are everywhere in Manila though their future seems uncertain. For some (and that includes city officials) they are traffic nuisance and for many others they are cheap medium of transportation in the city. They were entirely new to me because we don’t such things in Nepal though motorbikes crowd the roads. I heard the term motorcycle taxi first time in Goa in 2008 when I rode one- pillion ride on a professionally run motorbike and that becomes motorcycle taxi. Laws have been introduced to for tricycles to become environmentally friendly but the impact, it seems, hasn’t been desirable. 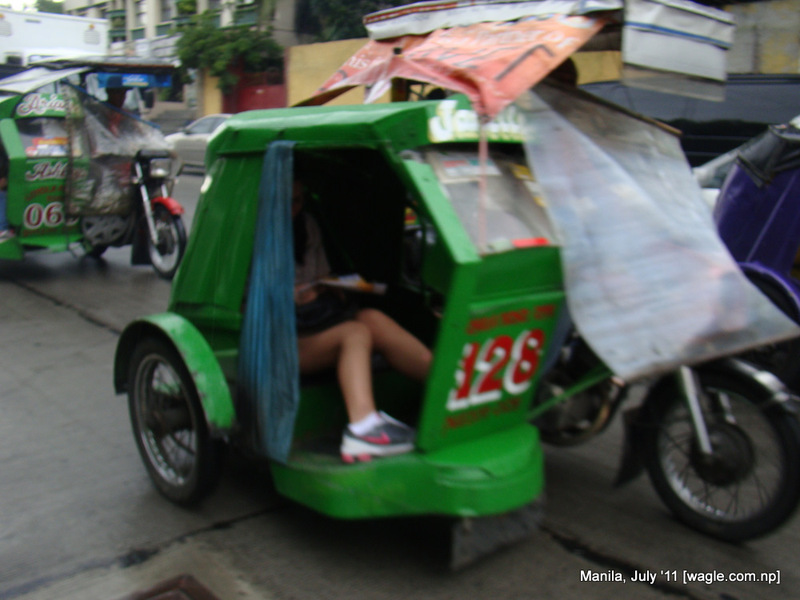 Whatever… here are a few photos of tricycles from Manila. The guy peeking from between me and the driver is my classmate Malte. They are totally ingenious (HOW DO YOU SPELL IT? ), aren’t they?